As I type this, Barack Obama stands on the steps of the Unites States Capital with his right hand raised, taking the Oath of Office as the 44th President of the United States of America. 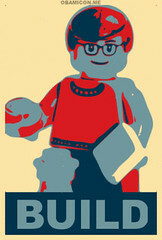 Like many LEGO fans, Michael Fortress wanted to mark the historic inauguration of president Obama. Inspired by the iconic Shepard Fairey “Hope” poster, Michael combined his graphic design skills with his passion for LEGO to create his own LEGO-themed Barack Obama “Hope” stencil poster. Check out more of Michael’s design projects on deviantART. Wonderful. It really does resemble the original poster. Wonder if he used obamicon me? I wonder how people will feel when they finally discover President Obama is just another politician, a product of the big machine and one of the most corrupt states in the union. I voted for him, and I wish our new Commander in Chief well, but the cult of personality surrounding him is out of control. What an unfortunate waste of a minifigure. I’m going to use the previous two comments to illustrate my request for civility. Keith expresses an opinion, and backs it up with rational argument. castlebuilder100 simply attacks the subject of the artwork. Both are entitled to their opinions, but please, dear readers, follow Keith’s example if you’re going to discuss politics here. I’m sorry. It’s a well done piece of art but I stand by what I said. Great digital media. I need to try the app mentioned above. Illinois is the 6th most corrupt state, but what does that have to do with anything? All the worst presidents seem to come from the south. GOLDMAN IN 2012! He’s not afraid to tell it like it is! I too, find President Obama preferable to President McCain at this moment in our nation’s history, but I hold no illusions that he is going to part the waters and lead us to the promised land. The man (and he’s just a man) has a tough row to hoe. We have a president whose middle name is honoring one of the most notorious dictators in recent history, and nobody seems to care. As Keith pointed out, Obama’s personality cult is getting psychotically out of hand. His popularity is much more than that of a movie star, and all he did was spent a single term as senator to become president. Not very long from now, I bet something wil happen that will make people renember the old adage, “be careful what you wish for”. I was even moved by his inaugural speech a bit. However, if America is for all of its people, politicians MUST renember to never shun what our great democracy was founded on, and that was Christianity. How do you think we’ve lasted this long!? Keep those words in mind. The poster is great, I am getting a few printed for myself. They are nice and novel. The Judeo-Christian God concept has been around for only a tiny percentage of the around 200,000 years of human existence. The fact you believe in it, is because of the time and place you were born and brought up. It is highly unlikely that any of it is “correct.” If you want to practice the religion, then it should be noted that all religions are just as “correct” and “incorrect” as yours, and probably just as ridiculous, they just happen to be from a different culture. If you were born in India you would be Hindu so what, you would be going to hell right? This is all childish garbage. Stop declaring that you are right, and stop justifying violence in the name or your religion. And his middle name was given to him before the “madman” was powerful. Hussein is a common name. Mohammad is the most common name in the world. But are the people who have thatname “honoring” the ringleader Mohamed Atta who organized the 9/11 attacks? Obama was born in the United States and he is an American Citizen. And a patriot who care about the country. This is a really remarkable work. Kudos to the artist! Also, to put the facts straight, many of the the Founding Fathers were deists, not bible-thumping Christians. Washington believed in “Providence,” which was a divine will–though he attended church regularly (as did a majority of them). The Constitution specifically separates church and state and makes for “freedom of religion” in the Bill of Rights. It grants as much freedom to choose any religion as much as it does to choose none. It is moot anyway, since Obama is a Christian. His decision to leave his church to distance himself from Rev. Wright was a major part of the politics that shaped his campaign. Finally, 3/4 of the world is laughing at you as his middle name is one of the most widely used around the world. Obama was not named for Sadam Hussein. It’s just a name–like Smith. Only in America is this an issue. King Hussein of Jordan was one of the US staunchest allies before he died in 1999. Shouldn’t we also say he was named after him? I am aware of these things, Ramone and Roman, But if one looks at the facts, it is very possible his middle name is honoring the last dictator of Iraq. Regardless of his namesake, (of which a ‘3/4ths’ is probably NOT laughing, it caused quite a stir when he announced candidacy) Barack could possibly be the last president of these United States. “Providence”, you say? What’s the root word? Provide. Such is what Washington might have called God’s Providing for him and his comerades. @ ‘Roman’; quoting Richard Dawkins!? The same Dawkins that said there could possibly be some sort of deity on Ben Stein’s documentary, “Expelled”!? You’re kidding, right? @ ‘Ramone’; Rev. Wright taught liberation theology. real ‘christian’. And I never said this wasn’t a great work of art, pictures that have color schemes of four or less colors are often quite visually striking. @Xiazeran: Barack Hussain Obama II, born in 1961, is named after his father, Barack Hussain Obama, Sr., born in 1936. Saddam Hussain was born in 1937, and didn’t even come to power in Iraq until his participation in a 1968 coup. So no, it is not in fact possible that Obama’s middle name “honors” Saddam Hussain. You’re entitled to your opinion, but at least get your facts straight. Xiazerans is funny as hell! Oh my god his name just happens to match one of an old ally of ours! Remember 20-25 years ago when we were on his side?! I remember pictures of several George W. Bush’s appointments meeting with the terrible evil dictator. I guess back then though it was OK for Obama to have a middle name he has no control over! People as foolish as your statement is make me sick. Well said, Xiazeran! I totally agree with you! Wonderful artwork. This style of poster design is both striking and beautiful. Nice work here. As for the rest of the conversation, I personally believe that politics and religion are personal, individual choices. You cannot and should not expect anyone to agree with or be interested in your version of history unless they ask about it. No one comes here to hear your religious or political views, especially when all you want to do is insult what others love. Just keep it to yourself or find somewhere they want your voice. My opinion is LEGO and politics/religion = water and oil. This is art since it does not actually use LEGO pieces, so can mix the two, and stir a conversation such as this one. @David 4; “people as foolish as your statement make me sick.” Really? We’re all people, regardless of gender or race. Thus said, people are not perfect life forms. Mistakes can be made. Enjoy your laugh, because I’m sure you’ll say something as easily misguided and ‘foolish’ in the future. Thank you everyone for the comments on this piece, I really appreciate it. This was not meant as a political statement. As an escape from real work it was fun piece to do and I meant it a tribute to the talented Shepard Fairey. However, people are not without opinions. Please be civil. Remember that we want the same thing, we just believe in different routes to that point. We voted for a president but we are hoping for a savior. That is a lot to expect from one man. My vote will be vindicated if anything at all changes for the better. @David 4; oooh! I just found something else I can poke at you with! “funny as hell”? Not so much if you’ll be burning there. Argh…can the comments on this one be locked please, it’s going nowhere. This is a sick man! He will close Gitmo! He says torture is not the answer! Tell tha to the innocent lives taken by radical ISLAMISTS! Yeah I said it. The terrorist don’t torture our boys they just cut off their heads on video! Why don’t we give some of their own medicine! Obama’s is not the presidnt of the United States of America! He is president of the United Socialist States of America! Hail Comrade Obama! First dictator of the USSA! @Doctor Sinister: An excellent suggestion, given how far off the rails this discussion has gone — and especially now that the artist himself has responded.